My name is Audrey Roberts and welcome to my blog Mama Knows Gluten Free! 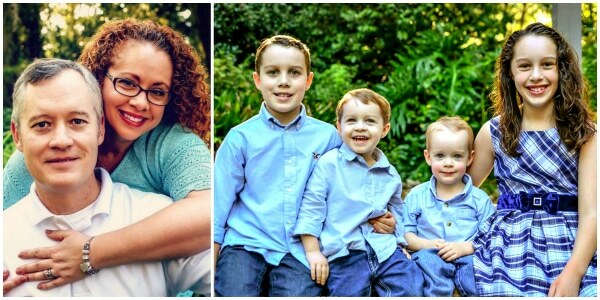 I am a child of God, a loving wife, a busy mama of four, living in North Florida on a small five-acre homestead. My family is my life. I love being a wife and mama to my little tribe! Cooking and baking are definitely one of my love languages. I am a foodie at heart! Growing up I enjoyed eating food from many different cultures (I’m an Air Force brat). I also spent ten years working in restaurants while I worked my way through college a few credits at a time. So going gluten-free really challenged my foodie side. I love to cook and I am always up for a challenge, so trying to modify some of my favorite meals is always fun for me. When I’m not helping my bigs with their school or wrangling my two littles, you’ll find me in the kitchen cooking and washing lots and lots of dishes. I suffered for 15 years with chronic digestive issues, saw many doctors, underwent several GI procedures (sonogram, upper endoscopy, and colonoscopy) but was not tested for Celiac disease. I was diagnosed with GERD and IBS-D but nothing helped my condition. I was so discouraged. That’s when my friend encouraged me to try a gluten-free diet because my cousin had been diagnosed with Celiac disease. I fought the idea of going gluten-free. I could not imagine that I had a food sensitivity. How could all of the doctors I had seen possibly missed that? With encouragement from my husband, my friend and lots of prayers, I decided to try a gluten-free diet. I knew that it was going to be really hard for me to give up all the food I loved, but the most amazing thing happened within three days of being off gluten. All of my digestive problems went away! With seeing how my body reacted to gluten when I got cross contaminated (think food poisoning), I never went back! I did a lot of research on the web to find out the do’s and the don’ts of the gluten-free diet and I started my journey in January of 2010. My hope is that by sharing my gluten-free journey, others might be helped with theirs. Trust me…nothing tastes as good as gluten-free feels! Recently I was diagnosed as having Non-celiac gluten sensitivity (gluten intolerance) in 2017 because I have not been tested for Celiac disease. You are probably asking yourself, why I have not gotten tested for Celiac disease? The simple answer is I’d have to go back and start eating gluten again to be tested. I was told by my GI doctor that I would need to do a three-month gluten challenge to be tested because I have been gluten-free for so long. Eating gluten causes me serious pain. I am not willing to go through that kind of pain to get an official diagnosis. There is nothing other than dietary changes that can eliminate my symptoms. My quality of life has completely changed since eliminating gluten from my diet and I will never go back to damaging my body like that again. I also was diagnosed with hypothyroidism and adrenal fatigue after the birth of my third child, so I am also learning as much as I can about how diet and supplements can help support my thyroid and adrenals (Paleo and Autoimmune Protocol Diet). As of 2017, I have also eliminated dairy from my diet as well. I hope by me sharing my journey it may help you with yours. This blog is about my gluten-free journey and the gluten-free and dairy-free recipes I love to make for my family. I am always meeting people, especially in the grocery store, who have lots of questions about eating gluten-free. I decided that this blog would be my way of being able to share the way my family eats gluten-free. I would like to help you to bake gluten-free bread and desserts and cook easy gluten-free meals that the whole family will enjoy. When I first went gluten-free in 2010 I found it difficult to find recipes that were family friendly. A lot of the recipes had expensive, hard to find ingredients that took a lot of time to cook. With littles, this mama did not have hours to cook dinner. So, I spent a lot of time trying to figure out how to modify my family’s favorite meals to be gluten-free. Eating gluten-free should not be super difficult and super expensive. Honestly, gluten-free products are more expensive, so I make sure that I maximize the ingredients I use in my recipes. What you find on this blog is what I bake or I cook daily for my family. I love searching for new recipes and enjoy the challenge of modifying them to become gluten-free. I also really enjoy creating my own gluten-free recipes. In 2017 had had the opportunity to be a featured blogger at the bloggers and author’s booth at the Gluten-Free Food Allergy Fest in Richmond, VA. I was also a presenter and official blogger for the GF&AF Expo in Atlanta, GA in 2018. I gave a class on Easy Gluten-Free and Dairy-Free Cooking and Meal Planning Tips. I have been also blessed by having my gluten-free recipes featured on Buzzfeed, Women’s Health, Yahoo Lifestyle, and Schär. I am also a guest columnist to the Tallahassee Democrat. I was also honored when I won first place in the 7th Annual Gluten-Free Cookie Swap and my Easy Gluten-Free Blueberry Banana Muffins was a winner in the Fyffes NA recipe contest and my recipe was featured in their video. Mama Knows Gluten Free has also been named one of the Best Food Blogs by Brand Ballot. My cookbook The Everything Gluten-Free & Dairy-Free Cookbook is now available for pre-sale on Amazon, Barnes & Noble, Books A Million and other online book retailers. If you have a favorite recipe you would like to be modified to be gluten-free please send me a message with your recipe. I would love to try and create a gluten-free recipe that is a family favorite of yours. I am always up for a challenge! There are lots of ways for you to keep current with Mama Knows Gluten Free. You can subscribe to my Newsletter join the Mama Knows Gluten Free Community have all my latest recipes sent directly to your inbox. I can also be found on Instagram, Facebook, Twitter, and Pinterest. I also have a Facebook group called The Gluten-Free Community Group I would love for you join. Let’s do life together! If you would like to contact me directly you can email me directly at [email protected] or fill out the contact form and I will get back to you as soon as possible. Feel free to leave comments on my posts or email me anytime. All writing, photographs and recipe instructions on this blog are copyright of Mama Knows Gluten Free. If you repost any recipes, photos or information from my blog please link it back to my blog post. For any other use please contact me.